As I write my final post for our humble blog here at Slow Swimmers & Fried Eggs, I find myself feeling blessed and so grateful to have had the opportunity to have this platform, to share my experiences with you all, and to heal myself through the power of reflection, honoring our shared humanity, and building community. I also find myself feeling wistful… about all of those beautiful folks reading these posts going deep into their souls to find hope, about my husband sharing his vulnerability and courage, about the folks at Conceive Hospital desiring to help their patients in every possibly way that they can, about the woman I was over 4.5 years ago – hurt, broken, scared, and sad – and the woman I am now – strong, healed, confident, and hopeful. What am I hopeful about? I’m hopeful not only about my own future, the future of my family (with or without children), but the future of the patients of Conceive Hospital and ALL of the fine folks who find themselves facing an infertility diagnosis with all that happens after that. What would be possible for you if you allowed that statement – or one that has incredible and powerful meaning to you – be your guidepost? One of the greatest challenges of my life has been accepting that I’m not who I thought I was supposed to be or who I always pictured myself being. And realizing… that’s OK. Sometimes those of us who struggle with infertility – or any struggle – we thrash and throw ourselves into the fire. The struggle is real. The pain is real. Yet sometimes I believe we allow ourselves to suffer more than we need to or for longer than is required. What if we set ourselves free from struggle at the appropriate time? That brings me to five things I learned through my journey here at Slow Swimmers & Fried Eggs, and through the challenges I have faced – such as infertility – challenges that have made me stronger, wiser, and more in love with my life than ever. You May Like Bursting with Excitement ! On your worst days, I want to encourage you to push through it! Push through your fear, your despair, your struggle. You can choose not to be defeated by your struggles. You can choose to learn from them. Share them. And press on. Try this inspirational videoon for size to help you. 3) Loneliness, Isolation and Depression Are Life-Threatening– Did you know that studies have shown that loneliness is more dangerous to your health than obesity, smoking, or alcoholism? Did you know also that my blog post about suicideas it relates to infertility is the most commented-on blog post I have ever written in my life? This is tragic, sad, and true. Combat loneliness and depression with community. This is an absolute MUST for your survival! First we must survive before we thrive. 4) Give Yourself Permission To Grieve– For some reason, we all “get” other diseases, ailments and handicaps that afflict us (such as cancer, diabetes, losing a limb, etc. ), and offer words of sympathy, encouragement, and even a casserole. But the invisible loss of our unborn children (whether stillborn, miscarriage, dead embryos post or pre-transfer) is not regarded in our society as actual LOSS typically. Yet to those who experience it, it can feel as painful emotionally as losing a limb, or a family member through death, or getting a cancer diagnosis. It can even be life threatening, whether society realizes that or not. This reminds me of the quote “Science: It’s true whether we choose to believe it or not.” The losses are real and can be numerous and over a long period of time. Please know that your feelings are valid and completely normal, though they may at times be uncomfortable. It helps to remember that we all have things in life that we struggle with. Some are just more easily understood readily than others. 5) We Are All Greater and Stronger Than We Think We Are– Remember this is true too at any age. Does our worth only come from parenting? From co-creating a human life? Or does our worth extend far, far beyond that? “I’d like to leave you with an interesting tale I recently heard, and it really tore me up after years of reading about infertility’s affect on our readers and many others. It’s a Japanese folk tale about an elderly school teacher who falls ill and, in a coma, travels to meet her ancestors on the very edge of death. “Who are you?” they ask her. “I’m the mayor’s wife,” she answers. On and on it goes until she finally stops casting about with identity trappings and ornaments and understand that the question is who she is herself, as a human being, independent of her role in others’ eyes or others’ lives. Only then do her ancestors decide to allow her to recover and go back to earth to continue her important, if humble, work. And with that, I will drop the mic. Though Eric and I will no longer be writing here at SS&FE, please feel free to reach out to me personally if you need support here on Facebook, or at my email: cathy@giantleapscreative.com. I look forward to speaking with you. As always, I wish you the best on your journey. Go forth and love (starting with yourselves). Awwww, Pamela… your words, your kind heart, your spirit, and your tenacity inspire me so dang much too. I am truly blessed and grateful to have someone as awesome as you in my life. THANK YOU for speaking your truth, for sharing your story, for being a brave and courageous champion for all of those who sometimes feel they don’t have a voice. I don’t know if I would have even written ONE blog post here if not for meeting you, reading “Silent Sorority” (your amazing book), and watching you put amazing whole-hearted, inspiring work out there in an effort to help make the world a better place. I love you, lady! Keep rocking it like I know you will, carrying that torch forward! I am so happy to run alongside you, yesterday, today, and tomorrow! Brava, Cathy. 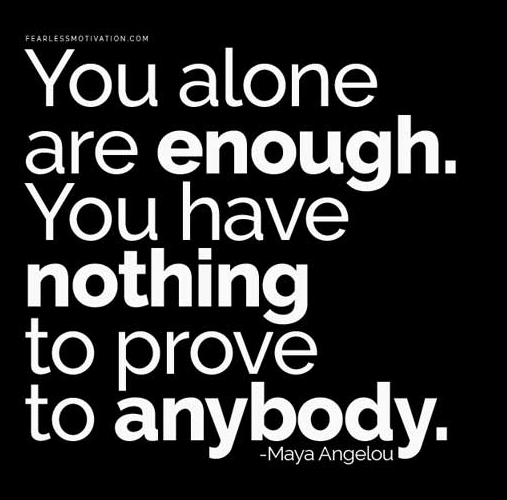 Such a great final post, with words of wisdom – your own, and your husband’s, not just Maya Angelou’s! This road can be difficult, but it truly does get better. I’m so glad you have represented that path here. Best wishes to you and Eric in the future.